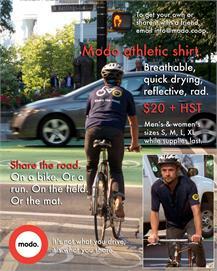 bike to work week: join TEAM MODO! Sure, you ride to work when the rhodos are in full bloom and the air is sweet with summer's perfume. But what about when the leaves have turned - when the fine mists of autumn curl your hair and cooler temps send you back inside to hunt down gloves... and change for the bus? Let good ol' fashioned competition get you on your bike! Bike To Work Week returns October 29 to November 2 (hey, that's next week!) offering great incentives to ride all week long. Brought to you by the good folks at HUB, BTWW lets individuals and workplaces log kilometres travelled, calories burned and carbon emissions saved for a chance to win great prizes. Plus, find Celebration Stations parked all along the bike routes with piping hot coffee, snacks, games and prizes! Awards are given to teams who log the most trips cycled and logged! Under "Team Setup", select "Modo The Car Co-op" as your "company or organization". Let's see if we can come out on top with the most trips logged in Metro Vancouver! Have questions? 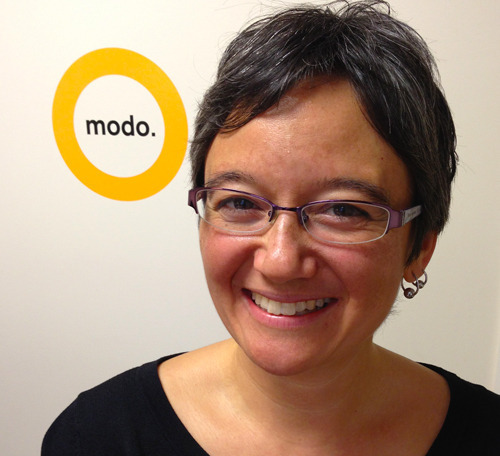 Email our Team Captain, Mona (pictured) at info@modo.coop. The United Nations has declared 2012 The Year of Co-operatives and to help celebrate, the British Columbia Co-operative Association (BCCA) and The Youth Excellence Society (The YES) invited young people from around British Columbia to create art about a local co-operative for the Co-op Youth Story Project travelling art show. The youth, aged 13-25, interviewed co-op members, founders, staff and community members, and have turned these 12 stories into works of art, including one about Modo! The group art show is now on tour, making stops in Nelson (October 18-21), Vancouver (November 7-9) and Duncan (November 29-December 1). Modo is proud to sponsor the project with carsharing credits covering the full tour. At the opening for each stop, each young artist will present his or her piece and share about the experience of discovering a co-op story. Plan to attend the Vancouver show at Athletes Village Housing Co-op? Snap a pic or shoot a video and post it to Modo's Facebook page! Last month, Modo was honoured to join John Oliver Secondary School’s 100-Year Reunion festivities, with Mayor Gregor Robertson, Jimmy Pattison, the 1st Generation Band, a fleet of food trucks and several generations of alumni! To demonstrate both how much and how little has changed in the last 100 years, Modo staffer and chair of the event’s organizing committee Farrell Segall (pictured here with Mayor Robertson) brought along our all-electric 2011 Nissan LEAF for display alongside a 1912 electric car. Modo has just welcomed another Nissan LEAF to the fleet! Find it on our car map in the coming weeks. Want to take your Modo membership to the next level? Consider joining our board! At Modo’s next Annual General Meeting, in January, we will be holding elections for the Board of Directors. The board comprises eight directors; at the AGM, two new directors will be elected for a three-year term of office. All co-op members are eligible to run for election. Find nomination materials and information on our website. Get ‘em while they’re hot, folks! Breathable, quick-drying, reflective and super rad, Modo’s new athletic shirts work great for cycling, running, hiking, playing sports and doing yoga. To purchase one for yourself or to share one with a friend, email info@modo.coop with your size, preferred method of payment (apply it toward your next invoice if you’re a member or pay by cash or plastic when you come to pick it up) and the date you expect to come pick it up at our office downtown (200 - 470 Granville Street, between Pender and Hastings). Oct 31-Nov 4 - South Asian Film Festival, Lower Mainland - Modo member discount! Get 30% off tickets to all SAFF films using the Modo member promo code: SAFFPPZ! Nov 2-4 - The Rio Grind Film Festival, Vancouver - Win tickets! CONTEST: The Rio Grind is offering one lucky Modo member two tickets to any film in the festival. To be entered to win, email marketing@modo.coop (with the subject "The Rio Grind contest entry") with your answer to the following question: What year was the Rio Theatre built? 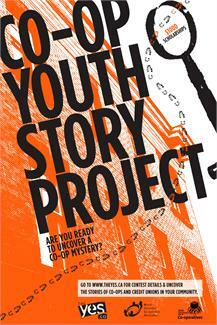 Deadline: Oct 30. The red 2007 Dodge Caravan will be upgraded to #279, a red 2009 Dodge Grand Caravan (scheduled for October 26). Car #410, a grey 2009 Toyota Matrix, has replaced the 2007 Mazda 5. The blue 2007 Dodge Caravan was replaced by #237, a green 2007 Dodge Caravan. UPGRADE: Cooper's ParkCar #396, a silver 2012 Dodge Grand Caravan, has replaced the 2007 Dodge Caravan. The 2009 Dodge Grand Caravan will be upgraded to #411, a white 2012 Dodge Grand Caravan (scheduled for October 26). We lost our stall at IGA near Main Street and East 13th Avenue so are looking into more parking options nearby. Main Street SkyTrain is currently hosting car #407, a red 2012 Honda Civic. The silver 2007 Dodge Caravan will be replaced by #233, a red 2007 Dodge Caravan (scheduled for October 26). The car at Tidal Flats Co-op was moved one block east, from Odlum Drive to McLean Drive, and the location is now called Watershed Co-op. Car #314, a grey 2009 Nissan Versa, has replaced the 2003 Volkswagen Golf. Under a new Richmond bylaw, Modo will soon have on-street parking near Richmond Brighouse station. Watch our car map over the coming weeks! Vancouver band The Ruffled Feathers book a Modo car for a day of music and fun with friends. Watch as they demonstrate how easy it is to carshare with Modo - from booking the vehicle, fobbing in and out, street parking, fuelling up, what to do if you're running late and more. Share the video with your friends who still haven't converted over - and get a $20 referral bonus when they join Modo!